The Queen first wore this tiara on her wedding day in November 1947, when she was still Princess Elizabeth. It was made in 1919 for her grandmother, Queen Mary; by 1947, it belonged to the Queen Mother, who loaned it to her daughter for the day. (She also loaned it to her granddaughter, Princess Anne, for her wedding more than two decades later.) 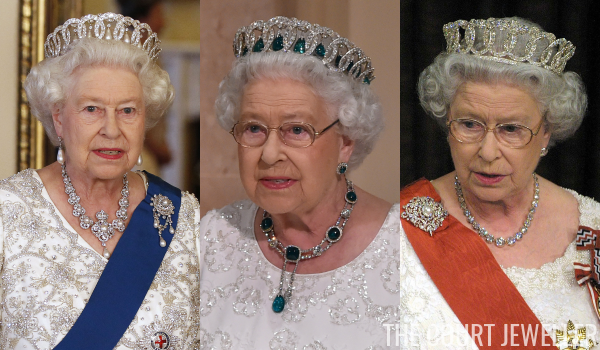 The Queen inherited the tiara from her mother in 2002, and she wears it occasionally today for white-tie events and formal portraits. One of Queen Mary's wedding presents to her granddaughter was this gorgeous diamond tiara, which she'd received for her own wedding in 1893 from a committee of women (the "Girls of Great Britain and Ireland"). The tiara is perhaps the Queen's favorite sparkler at all, in part because it is reportedly very light and comfortable to wear. More crown than tiara, the Queen inherited this diamond and pearl diadem when she became sovereign in 1952. It was originally made in 1820 for the coronation of King George IV, but since then it has been worn only by queens. You'll see the Queen wearing this diadem every year during the state opening of parliament festivities. 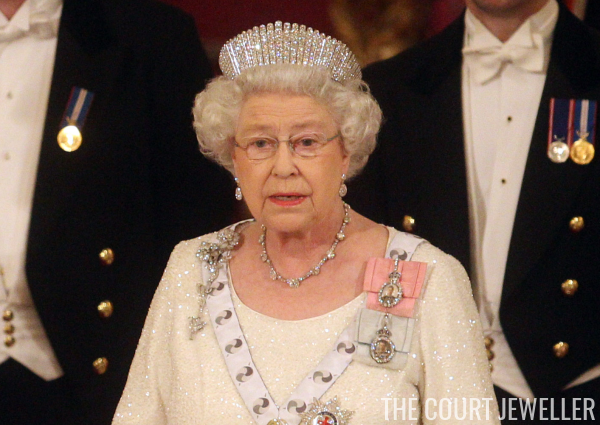 When Queen Mary died in 1953, she left her granddaughter a treasure trove of jewels, including this diamond tiara. The piece was made in 1888 as a silver wedding present for Queen Alexandra, who requested a kokoshnik-style tiara just like one worn by her sister, Empress Marie Feodorovna of Russia. The classic halo shape of the piece has made it a staple in the Queen's jewelry box for over half a century. Queen Mary also left her granddaughter this elaborate diamond and pearl tiara, which features lover's knot motifs. It was made in 1913 to resemble another tiara once owned by Mary's grandmother, the Duchess of Cambridge. The Queen wore it frequently in the early years of her reign, but she later loaned it to other Windsor women, including Diana, Princess of Wales and the current Duchess of Cambridge. Queen Mary purchased this tiara from the family of the late Grand Duchess Maria Pavlovna, wife of Grand Duke Vladimir of Russia; the jewel had been smuggled out of Russia following the revolution. Originally the tiara only featured pearl drops, but Mary had it adapted so that it could also be worn with drops from the Cambridge emerald collection. Since inheriting this piece in 1953, the Queen has worn the tiara in three ways: with pearls, with emeralds, and with no drops at all. Queen Elizabeth II purchased this tiara herself to fill a gap in her collection; she had a suite of sapphire jewels that had been given to her by her father, but the set lacked a tiara. The piece she purchased was a converted necklace that had once belonged to a distant cousin, Princess Louise of Belgium. The Queen wore it regularly until the 1990s; she also recently wore it for the Chinese state banquet. The Queen commissioned this tiara from Garrard to accompany a suite of aquamarine jewels that had been given to her by the Brazilian people. The original tiara was fairly modest in size, and in the 1970s, she had it reworked into the grander piece that she still wears today. 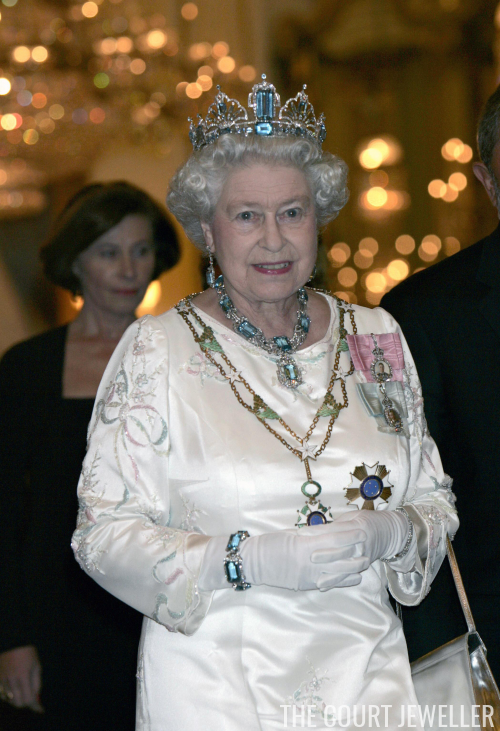 The Queen also has a smaller diamond and aquamarine tiara, composed of five aquamarines in a ribbon diamond setting. She wore it during a '70s era tour of Canada, but then it disappeared into the vaults. More recently, she's loaned the tiara to the Countess of Wessex. 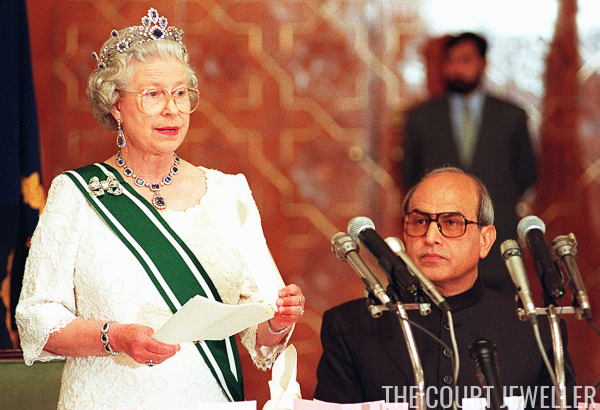 Using diamonds from the dismantled Nizam of Hyderabad Tiara, plus a cache of 96 rubies that had been given to her by the people of Burma, the Queen commissioned this tiara from Garrard in 1973. The addition of the sparkler to her collection meant that she had tiaras featuring all four of the major precious gemstones: diamonds, rubies, sapphires, and emeralds. 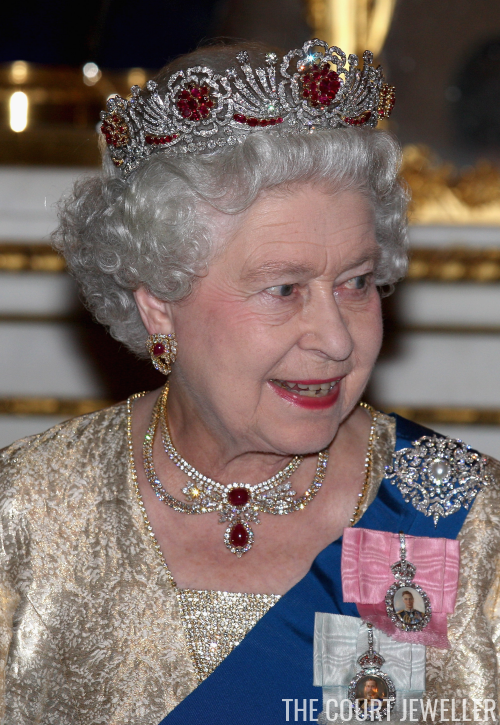 The elements of the ruby tiara are made to resemble a classic symbol of the British monarchy: the Tudor rose. The Queen wore this tiara precisely once: at the Fanfare for Europe event at Covent Garden in January 1973. A problem with the tiara she had planned to wear for the evening left her without one, and a friend, Patrick Plunket, lent her one of his family's tiaras as a quick substitute. (Tiara trivia: Patrick Plunket is also the person who advised Princess Margaret to purchase the Poltimore Tiara!) You can read more details from the story at the Royal Jewels of the World Message Board. 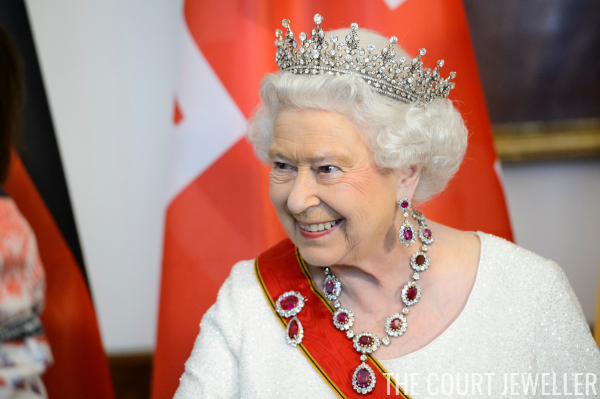 In 2002, the Queen inherited this diamond and ruby tiara from the Queen Mother. Designed by Prince Albert for Queen Victoria, the piece was originally set with opals, but they were replaced with rubies by opal-wary Queen Alexandra. 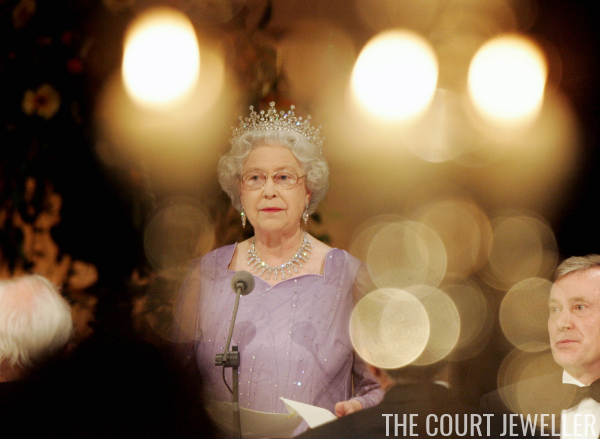 The tiara was one of the Queen Mother's most worn sparklers, and so far the Queen has only worn the piece once: during a visit to Malta in 2005. 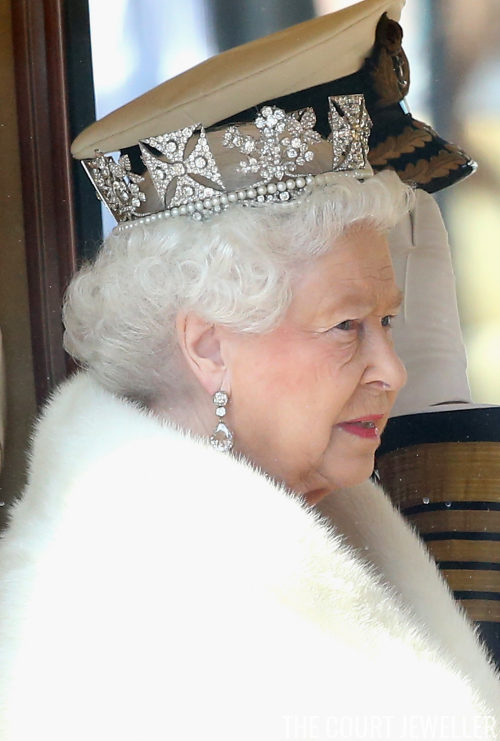 Which tiara worn by Queen Elizabeth II is your favorite?